From tortillas to injera bread, just about every country in the world has its variation of a quick, simple bread often prepared in a unique pan, on the grill, or in the oven. Then there’s the crepe. Let’s call it a multi-national bread because it has pancake cousins spread across continents, too. In this version, we have high jacked the Italian crespelle for the basis of an inspired Asian wrap. Semolina flour lends added chewiness and flexibility that makes it quite irresistible. There are so many dumplings and breads of note in the northern reaches of China that this crepe should feel quite at home wrapped around other Asian flavors, like Anise Poached Chicken from the previous post. Take the basic crepe batter, add a little chopped green onion and a smattering of mixed sesame seeds (or highly recommended Trader Joe’s Everything but the Bagel Sesame Seasoning Blend) and proceed as usual. 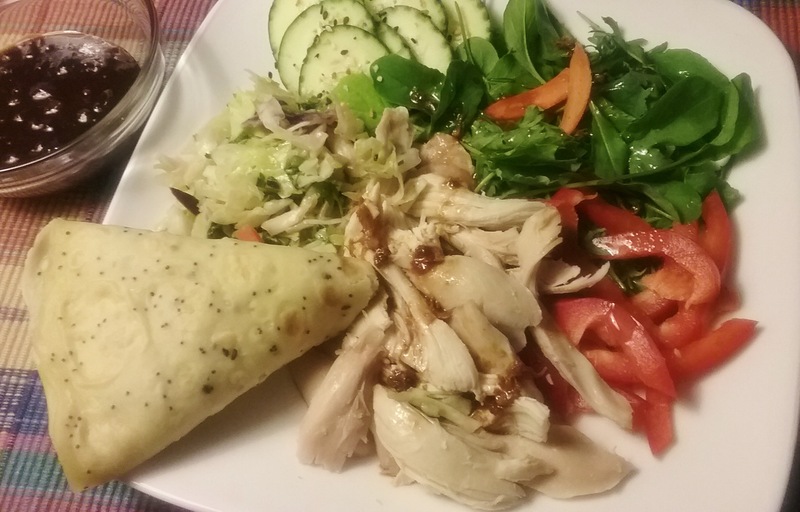 If you choose to go the Asian route, slather your finished crepe with hoisin sauce and wrap portions of Asian Salad, Anise Chicken, Char Siu, or other barbecue pork—you name it! Or, you could go New York-style, forget the sauce, and fill your crepe with creamed cheese and lox! In medium bowl sift the dry ingredients, beat the eggs, butter and water together and slowly add to the dry, whisking until smooth. Stir in the seeds and green onions to combine. Allow to stand at room temperature for about 1 hour or chill for up to 2 days and bring to room temperature before proceeding. Heat a 10” crepe pan or flat round skillet over medium to medium-high heat, depending on unit. Brush the surface with butter, or wipe with coated toweling. Stir down the batter and thin with a bit of water if it has thickened beyond the thickness of heavy cream. Pour about ¼ cup of batter into pan and quickly swirl it to reach the entire surface. Pour any excess back into bowl. Trim any errant edges as it cooks. When bubbles begin to form, about 1 minute, carefully turn with spatula or wood spoon and cook 2nd side for 30 seconds to one minute. Remove the crepe to a holding plate, wipe the pan if necessary with more butter and repeat, stacking the crepes with 2nd side up. Yield: about 10 crespelle. If made in advance, wrap the crepes in plastic wrap or foil. Can be made ahead 2 days, stored in refrigerator, or freeze well wrapped. *Trader Joe’s Everything but the Bagel Sesame Seasoning Blend is a mixture of white and black sesame seeds, poppy seeds, seas salt flakes, dried minced garlic, dried minced onion. 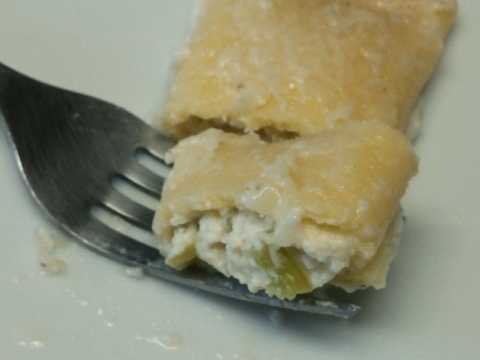 More on my previous manicotti post with crespelle, those endearing Italian crepes. Last night about 7PM I started thinking about dinner possibilities. I had previously pulled a small stack of crespelle out of the freezer from my crepe making binge, and left them to defrost on the counter. I was impressed, even stacked together they separated and were in perfect condition to go another round. 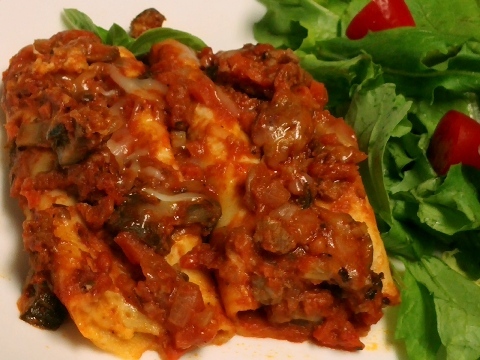 Peeking around the fridge, I spotted a cup or more of the delicious ricotta-Hatch pepper manicotti filling plus just enough Bolognaise Sauce for a few more manicotti. I quickly filled and rolled the pasta-like sheets, covered them with sauce, and sprinkled a bit of grated Parmesan on the top. In no time, dinner was ready to be heated up. But I was hungry, and the idea of waiting for this to bake another 20-30 minutes in the oven, was a non-starter. Instead, I covered the platter loosely, placed it in the microwave on reduced power (6), and gave it a couple of spins at 3 minutes each. While that happened I tossed together a quick salad and had “fresh” manicotti on the table within minutes. Yes, I was certainly hungry, but everything tasted better than the last time! These simple crepes are brilliant: they require no pasta machine, no messy rolling of dough—or boiling water to finish them. They are extremely forgiving, have a mild flavor of their own, and share the distinct tender/chewiness of pasta. Hands down: crespelle beat all pasta sheets and cylinders by a long shot. 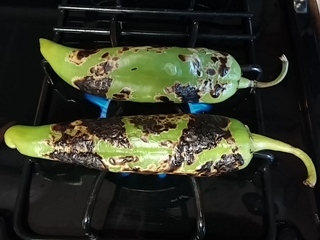 It is Hatch Chile Pepper season in Texas. Over in Austin, the air hangs ripe with celebration infused with the low hanging haze of roasting chiles. In case anyone missed the memo, local markets have their roasters prominently situated to further entice errant shoppers. It’s not just a party, it is a mania for the legion that has been previously bitten by the Hatch pepper bug. Typically this variety is not very hot—as peppers go in Texas—their flavor is sweet, mild, and earthy. Granted, they have a fairly short growing season, so if you are going to indulge, you best get with the program while they are here. I was one such person. As I dashed to the market to pick up a bunch of fresh spinach for manicotti, my course was immediately diverted by the aroma of roasting peppers. Forget the spinach. I was in the mood for peppers and it looked like it would surely be Manicotti stuffed with Hatch Chile Peppers. This all started out as a vehicle to test a crespelle recipe that I had been working on. Crespelle is the Italian version of the French crepe. 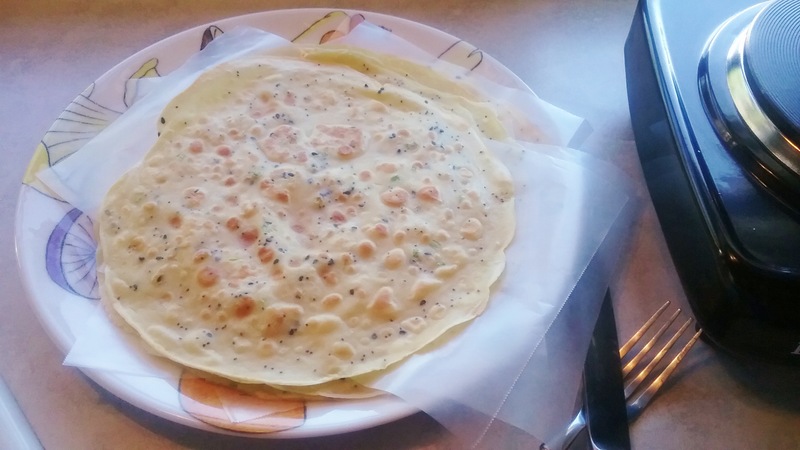 I wanted to maintain the integrity of pasta and to reduce the richness of the French crepe version, which is usually made with plenty of eggs, milk and butter. As with pasta, I stayed with a flour, egg and water base. I reduced the all-purpose flour and cut it with semolina flour, which lends incredible elasticity and a corn-like flavor; plus I added just enough egg for binding and to take advantage of the egg’s supple flavor profile. In the end, I retained a smidgen of butter since it definitely enhances the overall quality of the crepe. The manicotti morphed into a trans-national renegade. For the most part I stayed with my original filling concept. I also had a bit of béchamel sauce on hand which I smeared in the bottom of pan, and then spread the rest across the top of the manicotti; but it was an unnecessary step. For future seasons I would stay with plenty of cheese and let the Hatch peppers really shine. Cut the large crespelle in half to form 2 uniform square or rectangular “sheets”, about 4 inches wide. Set aside the trimmings, they are delicious ;). For the filling roast the peppers and remove skin and seeds; chop well. In a small skillet, sauté garlic in oil and add the peppers and oregano, tossing to combine flavors. Cool briefly. In medium mixing bowl, combine the cheeses, add the pepper mixture then stir in the bread crumbs, season with nutmeg, salt and pepper. Preheat oven to 350 degrees. Lightly coat the surface of a 7×11” pan with olive oil. To assemble the manicotti: on work surface lay out a cut sheet with widest side facing. Spread about 1 Tbsp of the filling along the bottom 1/3 of the crepe. Roll up the crespelle and place seam side down in the baking pan. Repeat, allow a bit of space between the manicotti. Sprinkle the tops with grated cheese. Cover with foil and bake 20 minutes; remove foil and continue until bubbly and top is toasted. Serves 4. 1 cup water, room temp. In blender, place all and blend until well combined. Allow to stand at room temperature for about 1 hour or chill for up to 2 days and bring to room temperature before proceeding. By hand: In medium bowl sift the dry ingredients, beat the eggs, butter, and water together and slowly add to the dry, whisking until smooth. Proceed as above. Heat a 10” crepe pan or skillet over medium heat to medium-high heat, depending on unit. Brush the surface with butter, or wipe with coated toweling. Stir down the batter and thin with a bit of water if it has thickened beyond the thickness of heavy cream. Pour about ¼ cup of batter into pan and swirl in to reach entire surface. Pour any excess back into bowl. Trim any messy edges as it cooks. When bubbles begin to form, in about 1 minute, carefully turn with spatula or wood spoon and cook second side for 30 seconds to one minute. 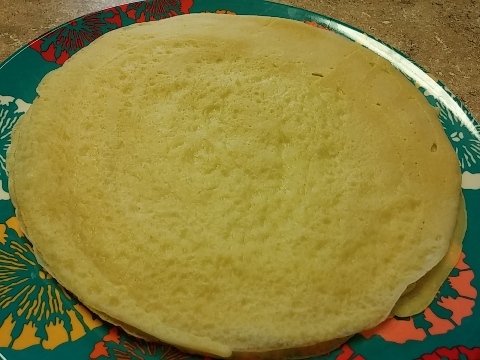 Remove the crepe to a holding plate, wipe the pan if necessary with more butter and repeat, stacking the crepes with second side up. Yield: about 10 large crespelle. If made in advance, wrap the crepes in plastic wrap or foil. Can be made ahead 2 days, stored in refrigerator.